In this review I’ll cover all the essential factors you need to consider when buying your Viparspectra Dimmable Series PAR450 grow light. Hopefully you’ll determine if it’s right for your grow setup. If not, that’s okay because I’ve also reviewed a ton of other size LED grow lights on our home page and you’re bound to find a good match over there. What are the essential factors you need to know when buying a grow light? I intend to discuss the Viparspectra dimmable series PAR450’s LED type, PAR reading, grow space coverage, power usage, warranty, and more. Yeah, in this Viparspectra Dimmable Series PAR450 Review, our primary concern will be its quality and bright sides. Also, we’ll get you familiar with dark sides attached to it. Yeah, it’s going to be an utterly non-biased review for everyone out there. 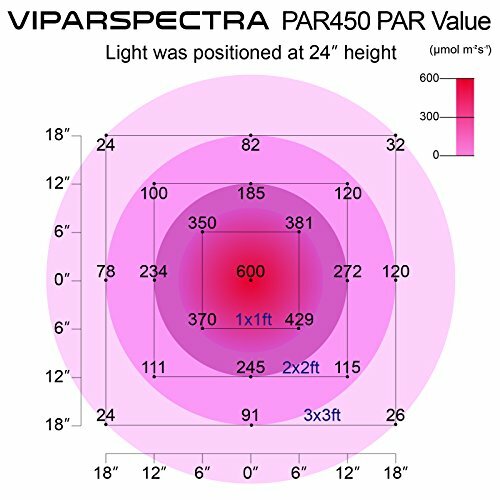 For ease of understanding, we’ll divide this review into several parts like features, advantages & disadvantages, specifications, and some tips for getting maximum out of Viparspectra PAR450. Also, we’ve surveyed our readers, and we’ll give a glimpse over people’s opinion regarding Viparspectra Dimmable Series Grow Lights. So folks, should we begin with our review now? 1.2.2 Spectrum – How effective it is for plant’s health and growth? 1.2.3 PAR Results – How Intense The Light is? 1.2.4 Coverage Capability – What about it? 1.2.5 Power Efficiency – Is It Pocket Friendly in Long Run? 1.2.6 Cooling and Heat Dissipation – Positive OR Negative? We’ll begin with a short introduction to the brand as we believe it helps in determining trustworthiness and reliability for users. As far as Viparspectra is concerned, it is a brand known for customer satisfaction and requirement fulfilment. You can imagine its value by looking at the number of extensive product lines each dedicated to a specific purpose of grow light in indoor growing jobs. 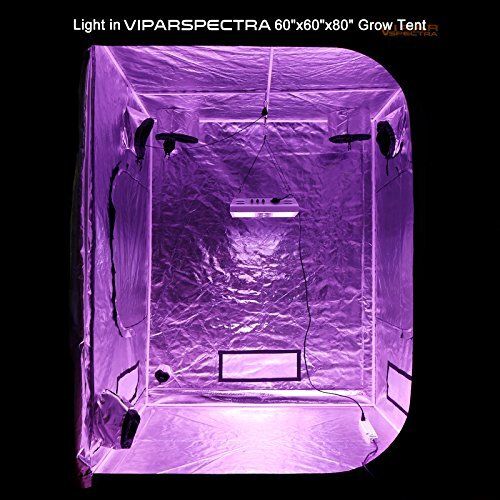 Viparspectra has been producing for indoor cultivators for more than 8 years and built its reputation over time. So yeah, from trustworthiness and reliability point of view, we didn’t find a single point to doubt on it. However, it is not brand that’s going to fulfill the need of your plants so don’t bother with it much. Instead, focus on quality and effectiveness offered by Viparspectra products. In this case it’s the Viparspectra Dimmable Series PAR450 LED Grow Light. So, now dive deep into its specification details and features. Also, we’d start with the features that captured our attention and forced us to craft this Viparspectra Dimmable Series PAR450 Review. The first thing we liked about it is three separate dimming knobs. Generally manufacturers provide 2 dimming knobs at max, but Viparspectra also offers white light dimmer. With the help of these 3 dimmers you’ll have extreme control over brightness and effectiveness of color blending. The second feature we think is unique is 2 powerful fans with dimensions of 3.2” on the front side of the panel. Generally manufacturers provide cooling fans at the backside of the panel, but Viparspectra Dimmable Series PAR450 450W Grow Light features it on the front side. Initially, it was an experiment to improve heat dissipation. And guess what? Viparspectra succeeded with this front side fan design. The third point is PAR Test Results. Yeah, in this case, it can beat even some of the 600-900W LED Grow Lights on the market. 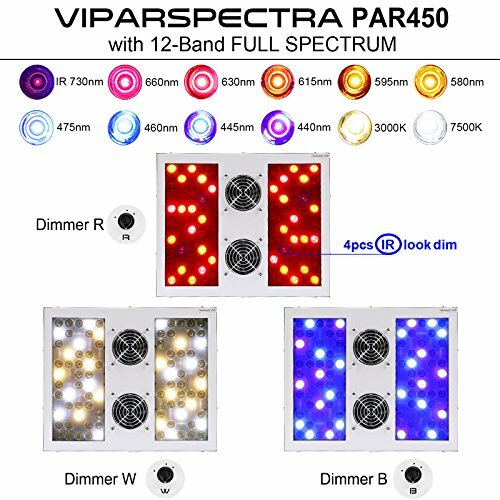 We must say that with best PAR results even some of the top-rated brands in the same price and wattage segment will fail to beat Viparspectra PAR Series. At last, we’d like to admit that it’s a symbol of heavy duty build and perfect design. We’ll begin with build and design and then explore all other vital parts of this tremendous masterpiece in the detail. 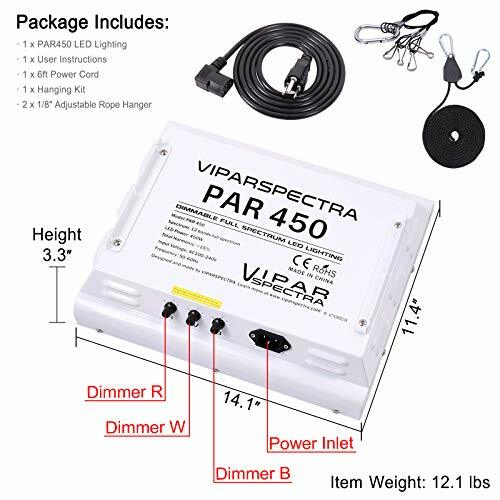 Viparspectra PAR450 is built using high quality and durable materials. Just look at it and you can see this is a carefully designed piece of professional equipment. It features dimensions of 14.1” X 11.4” X 3.3” and weighs around 12.1 lbs. Yeah, from its weight you can imagine the level of strength it possesses. Also, parts such as drivers, sink, body material, switches are manufactured by well-known brands on the market. For convenience while using it then as we stated earlier, it features three separate dimming knobs and offers complete control over brightness and color blending. It’s not only on/off either. It’s highly customizable light dimming with each knob adjusting by 25% increments. Find your perfect blend! 90pcs High quality LED chips of 5W each it there to back it up with extreme brightness and intensity. Also, the optical lens as cover helps in maximizing the effect of light. White color coated design makes it an elegant piece of equipment for all the indoor weed cultivators. Spectrum – How effective it is for plant’s health and growth? Spectrum is the key to success in your indoor growing job, as we often mention. As far as Viparspectra Dimmable PAR450 LED Grow light is concerned, it is equipped with 34 Red LEDs, 26 Blue LEDs, 26 White and 4 IR/UV LEDs. Yeah, it is the most ideal ratio of blue and red by keeping overall growth and lifecycle of plants in mind. If we look at ranges of color bands, it ranges between 440nm to 730nm. Also, the overall ratio of Blue:Red: White in light effect is 5:3:2 which is measured as an actual effect in the spectral graph created by real bright effect created inside the grow tent. However, during the flowering phase lowering blue effect and maximizing red effect will help in getting best yields using this grow light. Moreover, This grow panel is designed by keeping overall growth and flower quality in mind, and hence they relied on significant blue for better growth during vegetation. 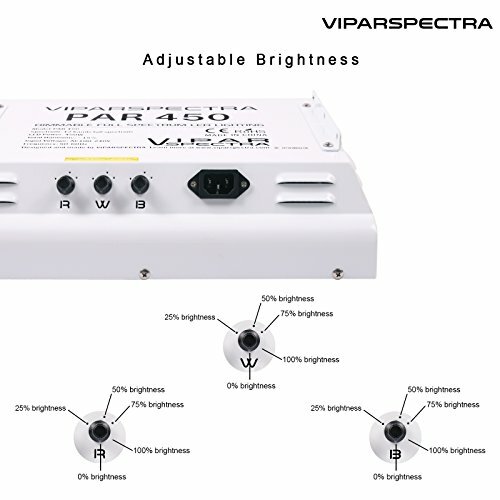 The Viparspectra Par450 will in turn provide you healthy and heavy buds coated by smooth resin. PAR Results – How Intense The Light is? As we mentioned in our attention-grabbing features of PAR450, results obtained by this grow light concerning PAR tests are remarkably unbeatable. Yeah, from the height of 24” it provides around 600 uMol in test results. However, we must say, ideally recommended height for a grow light is 18”. So you’re free to tinker with the height as you will. Even some of our readers informed us that using Viparspectra Dimmable Series PAR450 is much better than their previous grow light they used. Coverage Capability – What about it? 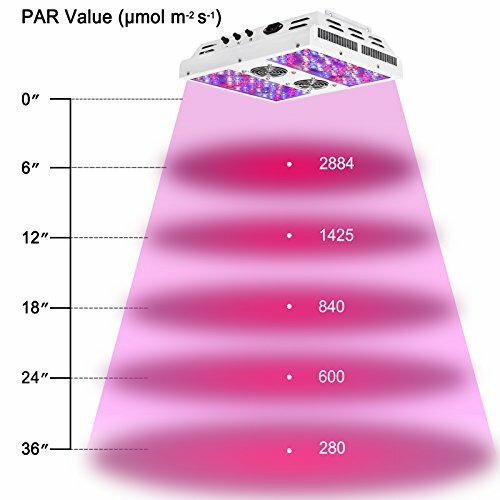 Now, as you’re familiar with PAR and Spectral capabilities of PAR450 grow light, you can imagine for what amount of area this grow light is an ideal fit. However, Manufacturer recommended that this grow light is ideal for 2.5’ X 2.5’ of growing space from the height of 32” during vegetation and during bloom it can cover around 2’ X 2’ of grow area from the height of 24”. Moreover, our recommendation says that while growing marijuana your plants should be as much closer as possible and also you should consider testing the height by observing plant leaf to ensure they’re not getting burned due to close light. I recommend to keep it at 18” during blooming and 24” during vegetation, so according to our expert’s final opinion coverage that it’ll provide will be around 3’ X 3’ during veg and 2.5’ X 2.5’ during bloom. Yeah, we aim to get maximum out of Viparspectra Dimmable Series PAR450 450W LED Grow light without any light waste. In Case, You’re looking for something that meets your need of 4’X4′ Of Coverage Capability then Look At our following article. 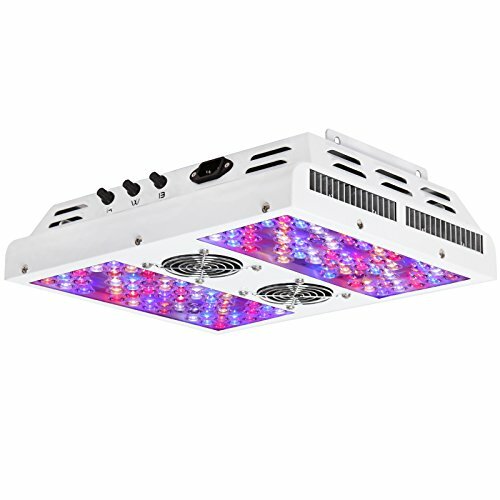 Best Full Spectrum LED Grow Light For 4’X4′ of Grow Space. Power Efficiency – Is It Pocket Friendly in Long Run? The key factor that we believe as a primary concern from user’s point of view. Yeah, an ideally perfect choice should not be economically imbalanced, and that’s what we want our readers to keep in mind while making their decision for choosing the best LED Grow Lights. We’re glad to inform in this Viparspectra Dimmable Series PAR450 Review that it is entirely budget friendly concerning power efficiency as well. Yeah, it just pulls on around 200W±3% which is entirely acceptable from a grow light with this level of PAR results and customization options. Depending on your dimmer settings it’ll increase or decrease by 3%. So, at max, it’ll pull around 206W when you set all the dimmers at max. Well, from power consumption’s point of view it passes the test with its performance. Cooling and Heat Dissipation – Positive OR Negative? While all other brands are stuck to the old and traditional way of heat dissipation systems, Viparspectra comes up with something fresh and unique. Yeah, Instead of placing cooling fans at backside they’ve used front side as a preferred location in their Dimmable PAR450 Series. In Reality, it was an experiment but resulted in positive effects inside grow space, and they’ve used this way for their product line. Yeah, Viparspectra Dimmable Series PAR450 450W LED Grow Light is equipped with 2 fabulous yet silent cooling fans on the front side of the panel. With this kind of placement it helps both, yeah plants and panel both are getting benefited by front side placement of cooling fans. Also, it ensures fresh and cool canopy surface even after penetrating light all over the plants. Viparspectra offers 3 years customer oriented warranty for all their products. Also, 30 Days money back guarantee is an added advantage. If you’re concerned about the quality of support then in case of failure you have to drop an email to them, and within 24 hours time period they’ll take follow up. Also, you’ll get a resolution in a discrete manner and on time. Now have a quick glance at the Pros and Cons section just below. Trustworthy Brand Praised by Thousand of Satisfied Customers. Added durability in build with high quality materials. Effective full spectrum light suitable to all kind of plants. Well balanced Blue:Red Ratio for all over growth of indoor plants. 3 Dimming knobs offers full control over intensity and brightness. Observed and verified outcomes are better than other brands. Low Power Cosumption to balance long run cost of your indoor growing job. Well placed and well working Cooling fan. Tremendous warranty period with guaranteed customer satisfaction. Light lacks use of daisy chaining. Even being great on the side of PAR and Power Efficiency, Recommended coverage is limited to 2.5’ X 2.5’ at max. Could be controlled using timer but it’s not equipped with one. Your plant needs high quality of light we agree, but overuse of light could hurt your plants. Even in some cases it leads to entire grow job failure. So give a periodic rest to your light. For better use follow this schedule for using it at its best. Set brightness according to your plant’s life cycle. During Vegatation your plant needs high amount of blue while during blooming more amount of red could bring tremendous outcomes. Never look at the raw light with a naked eye, try wearing safety glasses. Panel isn’t waterproof, so keep it away from dripping water. Keep a habit of regular observation of your grow space and plants, and if you notice any leaf burn or something like that then prefer hanging it high compared to existing position. For best results go for a top notch and highly reflective grow tent. That’s all for this Viparspectra Dimmable Series PAR450 LED Grow Light Review. I hope you enjoyed it! Looking at the level of appreciation grabbed by this beast, we don’t have anything bad to say about it. Compared to other grow lights in the same segment with the same price range it provides much better results and performance. As far as this Viparspectra Dimmable Series PAR450 450W LED Grow Light Review is concerned, we’re recommending it to our readers. Also, we’ve verified that PAR Results from the Dimmable PAR450 can even beat some of the top-notch 600W LED grow lights and in some cases even COB LEDs.